Nikko, at roughly two hours from Tokyo, abounds with both the shrines and temples that are World Cultural Heritage Sites and other buildings rich with historical significance. Hot springs can be enjoyed year-round. In all respects, it is a booming tourist destination, popular among travelers. Nikko also has a history as a holy site for Japan’s ancient mountain worship, and beyond the World Cultural Heritage Site shrines and temples, a vast natural expanse remains. As we head from spring into summer, let us introduce some outdoor activity trips for you to experience, surrounded by the natural beauty of Japan. Although many tourists come to Nikko to see the World Cultural Heritage Site, it is also an area of Japan with abundant water resources. As a former holy site for Japan’s ancient mountain worship, many monks would come and suffer through the harsh natural extremes here as part of their religious practice. Many areas of natural beauty remain, and Nikko is home to Japan’s first designated national park. A wide range of natural riches can be found here, including Lake Chuzenji, with its roughly 25 km circumference, Kegon Falls, with its precipitous 97 meter drop down a sheer cliff face, Senjogahara, with many of Japan’s moors and bogs, and Mount Nikko-Shirane and Mount Nantai, among several of the mountains here that are listed among one hundred most famous peaks. The plateau lands are also rich with lovely, clear water resources. In addition, access from Tokyo is convenient, and although Nikko falls within Tokyo’s suburban realm, it remains a locale where visitors can experience the diversity of Japan’s natural splendors. Roughly two hours on the Tobu SKYTREE Line from Asakusa Station to Tobu Nikko Station on the Tobu Nikko Line. Senjogahara was formerly a mountain lake that has gradually become wetlands. At present, it is among the largest of Japan’s moors and bogs with a total area of roughly 400 hectares (988 acres). At 1,400 meters (4,593 feet) in elevation, there are many alpine plants, as well as a wide variety of wild bird species. Experience the vastness of Japan’s natural beauty here. Senjogahara is well known for its hiking courses, with well-maintained paths. Even novice hikers will find easy routes that last no more than two hours. With Mount Nantai as a backdrop, the observation points that allow you to look out over the vast wetlands are highly recommended. Board a Tobu Bus bound for Yumoto Onsen, from Tobu Nikko Station, and exit the bus at Akanuma, where the hiking courses begin. With its abundant natural water resources, Nikko allows visitors to enjoy water activities while surrounded by the stunning beauty of Japan’s nature. Lake Chuzenji, broad and calm, allows even novice visitors to enjoy time on the water in a canoe, kayak, or SUP. Gathering places for any of those craft can be found near the parking lot for the Chuzenji Kanaya Hotel, making them extremely accessible from the hotel, and easily enjoyed. Beginners, small children, and persons unsure of their physical prowess can board these highly stable kayaks and enjoy the majestic natural beauty that surrounds them as they relax on the surface of the lake. There are two outings each day, in the morning and afternoon, so enjoy a canoe picnic over the course of two and a half hours that suits your schedule. Not only will you experience kayaking on the deeply blue waters of Lake Chuzenji, your tour will take you to hideaways and deserted beaches where you can relax and enjoy lunch. Breathe deep in the relaxing air of the forests around you. Kayak touring allows for a full day of experiencing Nikko’s natural splendors and is available once a day. Note: To join the tour, please submit a request at the Nikko Concierge tourist office in Tobu Nikko Station up to 24 hours in advance. This plan, offered twice daily, mornings and afternoons, is for beginners who wanted to safely experience riding a SUP on Lake Chuzenji. Row over Lake Chuzenji in a seated position to begin with, and then challenge yourself to row from a standing position at the end. All needed equipment is included in your plan backpack, so you can easily join in the fun. SUP yoga strengthens your core just as you ride the boat, without you being aware of it. Most poses are simple and occur from a seated position. Let the yoga, combined with Lake Chuzenji and the natural splendors around you, refresh your body and soul. Guided by personnel with SUP yoga licenses, you will also be challenged to try more difficult positions, for an exciting experience. NOTE: There will be new entries for the SUP yoga plans on this website starting on Monday, April 23rd, so you should be able to make reservations from that date on. NOTE: Plans are for persons weighing a maximum of 100 kg (220 pounds). Although Mount Nikko-Shirane, at 2,578 meters (8,458 feet) in height, is one of Japan’s one hundred most famous peaks, the Mount Nikko-Shirane Ropeway makes it easily accessible for everyone, including small children. The well-maintained trails allow you to hike up and back in a period of five to six hours. The ropeway is in operation from May through November. See the website below. Lake Chuzenji, the many waterfalls, the wetlands, and plateaus are all a result of Mount Nantai’s volcanic eruptions. This mountain, at 2,486 meters (8,156 feet), truly gave birth to the Nikko as we know it today. Beginning from Futarasan Shrine, at the base of the mountain, your climb will allow you to enjoy true mountaineering. You can reach the summit in roughly three or four hours, from which point your vista will include Lake Chuzenji below, when the weather is clear. You might also look out over a beautiful sea of clouds, depending on weather and seasonal conditions. NOTE: This mountaineering course requires an intermediate skill level. The appropriate gear will be needed when attempting it. The Chuzenji Kanaya Hotel, located near the hub of water activities, is built in a log-cabin style, surrounded by forests, along the banks of Lake Chuzenji. As each room includes a balcony or wooden deck, you can easily take in the natural beauties of Oku-Nikko from your hotel room. Attractions include locally sourced meals and hot spring waters drawn from Yumoto, some 12 kilometers (7.5 miles) distant. At night, you can soak in open-air baths as you look up at a sky flooded with stars. Senjogahara is also a recommended location for stargazing. At roughly eight minutes by car from Chuzenji Kanaya Hotel, at an elevation of 1,400 meters (4,593 feet), Senjogahara offers a view of a night sky simply bedazzled with jewel-like stars. At a tourist center located within Tobu Nikko Station, the gateway to Nikko, the Nikko Concierge was opened in November of 2017 specifically as a tourism resource for travelers from overseas. The staff here can assist with both tourist destinations and transportation guidance, as well as with making reservations for activities you might not have been able to arrange in advance. There are always personnel available who speak both Japanese and English, so feel free to consider them a resource for a more enjoyable trip. When you need more information near Lake Chuzenji, with its abundant natural resources, we recommend a visit to the Nikko Natural Science Museum, which describes the natural beauties of Nikko with displays and video presentations. The Oku-Nikko Information Center, a guide center for overseas travelers, will open in April of 2018, at the museum’s entrance. The personnel there can guide you to Nikko’s natural vistas, including information on hiking courses, in English. In addition, the "Oku-Nikko Cycle Share," a bicycle rental program, will start in April as well. Even less physically active guests can enjoy bicycling around the Nikko tourist destinations with the power-assisted bicycles. 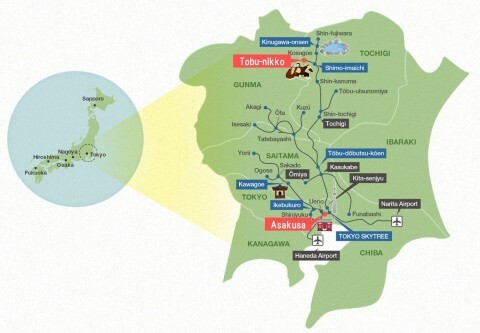 Tobu Railways has published a guide map, loaded with information on the Nikko and Kinugawa areas, for visitors to Nikko from overseas. With listings in nine languages (English, Spanish, Traditional Chinese, Simplified Chinese, Korean, Thai, Italian, French, and German), recommended locations within Nikko City are grouped into three main categories: Historical and Natural Attractions, Dining and Accommodations, and Entertainment and Activities. There is also a large map which allows you to understand where you are at a glance, with the names of train stations and bus stops listed to make travel to different locations easier. These are available at various Tobu Group facilities, including Tobu Nikko Station, as well as at tourist centers, and you can download the map’s data from the website below. There is also a tourism map for Muslim travelers available. In addition to listings for facilities where you can stop and pray, there are fifteen listings for restaurants and hotels that offer Halal options. This is also available at various Tobu Group facilities, including Tobu Nikko Station, as well as at tourist centers, and from the website below. A gorgeous new photo book, Magnificent Nikko, has been published to offer visual reminders of the natural, cultural, and historical beauties of Nikko to Western travelers. Lake Chuzenji was born with the eruption of Mount Nantai some 20,000 years ago. The chain of peaks that surrounds the lake was considered a holy site, created by the gods, and has been revered as such within Japan’s ancient mountain worship for more than 1,200 years. And some four hundred years ago, Ieyasu Tokugawa, the first shogun in the line of the Edo shogunate, indicated in his will that his remains were to be enshrined at Nikko, where the gods were known to gather. As such, Nikko Toshogu Shrine was constructed, which has now been listed as a World Cultural Heritage Site. The artisans who worked on that site, centuries ago, remained in Nikko, sparking a unique cultural evolution. To this day there are many shrines and temples in Nikko, and mountain worship continues. Many people continue to make their way to Nikko as they seek encounters with the gods. Magnificent Nikko will be available at travel expos held throughout the world where the Tobu Railway Group is participating, and will be included in the Tobu Japan Trip, issued as tourism information for the Tobu Railway Group. The attraction of Nikko will be even more prominent as a result. The TOBU Railway Group is a major Japanese corporate group consisting of approximately 90 companies. The Tobu Railways cover the longest operating distance in the Kanto area, and lead to many tourist attractions including Asakusa and TOKYO SKYTREE TOWN in Tokyo, Nikko and Kinugawa Onsen, famous as a world heritage and hot spring location, the Tatebayashi and Ashikaga area known for its beautiful blooming flower fields, and Kawagoe, where the atmosphere of the Edo era still live on. NOTE: See the following website for additional materials and images for media use.